WASHINGTON (Jan. 30, 2015) -- "You've always been just a Soldier. And you need to say that," said Sgt. Maj. of the Army Daniel A. Dailey, relaying the advice given to him by retired Sgt. Maj. of the Army Robert E. Hall. Dailey, who most recently served as the command sergeant major at U.S. Army Training and Doctrine Command, or TRADOC, was sworn in as the 15th sergeant major of the Army during a ceremony at the Pentagon, Jan. 30. 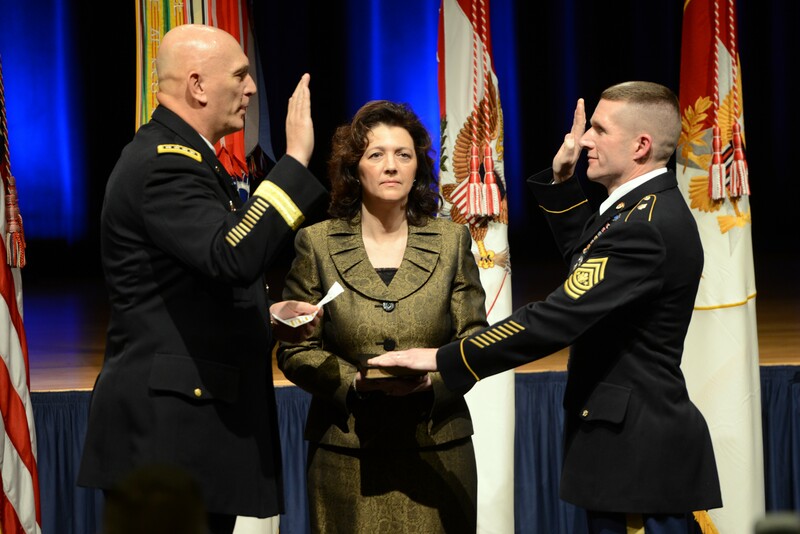 Chief of Staff of the Army Gen. Ray Odierno administered the oath to the new senior enlisted advisor. Chief of Staff of the Army Gen. Ray Odierno administers the oath of office to Sgt. Maj. of the Army Daniel A. Dailey at the Pentagon, Jan. 30, 2015. Dailey's wife, Holly Dailey, holds a Bible during the ceremony. The role of the sergeant major of the Army is primarily to advise the chief of staff of the Army on issues related to the enlisted force, and to pursue objectives laid out by the chief of staff of the Army, or CSA. During an interview, Jan. 30, before having been sworn into office, Dailey said Odierno had already discussed objectives with him, and that after he settles into his new job, he is expected to start off in his new position by visiting with Soldiers around the Army. "The chief wants me to get out and see the force," Dailey said. "It's critical I hear their voice, and carry that back to the chief and the secretary of the Army." Dailey said he expects to visit areas with large Soldier populations. Included among those might be the 1st Armored Division at Fort Bliss, Texas; the 1st Cavalry Division at Fort Hood, Texas; the 1st Infantry Division at Fort Riley, Kansas; and the 3rd Infantry Division at Fort Stewart, Georgia. Dailey also has his own ideas he brings with him to the job -- ideas about Soldier development, physical fitness, and women in combat, for instance -- topics he became familiar with while serving as the senior enlisted advisor at TRADOC. Most recently, the Army announced that female Soldiers will be allowed, for the first time, to attend Ranger school on a trial basis. This April, 60 slots will be made available to female Soldiers during a Ranger course assessment at Fort Benning, Georgia. The change is something Dailey said he welcomes. "Is the Army ready for women in combat arms? I think we are past due," Dailey said. "I think we should give every Soldier, regardless of gender, the opportunity to serve in any military occupational specialty. What I am excited about is that we are using a standards-based approach, just like we should for everything we do in the Army. Regardless of gender, those Soldiers who are physically capable and want to compete and try out for these schools and military occupational specialties will be eligible to do so. I think it will make our Army better." A key area of focus for TRADOC, and now the newest sergeant major of the Army, is continued maintenance and development of the non-commissioned officer, or NCO, corps. "I am carrying on some of the initiatives that we started when I was the TRADOC sergeant major," Dailey said. "I truly believe that we have a lot of work we have already done, and there also is a lot that still needs to be accomplished, to further professionalize our professional military education system for our NCOs and Soldiers." One area of development, Dailey said, is placed firmly on the shoulders of Soldiers themselves: structured self-development and civilian education. "Our non-commissioned officers and Soldiers need to understand that a critical part of the development phase for a Soldier is the development they do on their own -- utilization of the structured self-development platforms that we initiated and utilization of tuition assistance for them to take college credit and certifications," Dailey said. Equally important, he said, is maintenance of the operational skills Soldiers have learned from 12 years of combat. Soldiers who have participated in combat operations in Iraq and Afghanistan will eventually leave the Army, and their experience will leave with them -- unless they pass it on to the Soldiers that follow in their footsteps. The Army wants them to pass that information on, Dailey said. He also said that with combat operations having been drawn down, there will be more time for Soldiers to develop those professional skills, and to also transfer what they have learned from 12 years of conflict to the new Soldiers arriving in the force, fresh from basic training. "We have to make sure our NCOs are using those skills they learned over the 12 years of war, and translating those skills to our young Soldiers, and ensuring they are maximizing the time," Dailey said. He said there's more time now for NCOs to spend with younger Soldiers to do critical unit-level training. Dailey said the Army is becoming an "Army of preparation," and must be ready for whatever the nation asks it to do, and that means continued training. "I've always said the harder you train in garrison, the easier your combat experience should be," Dailey said. "It's critically important for our NCOs, and our leaders and officers that have served overseas for the last 12 years, to maintain those skills. And they also have to educate and train the future Soldiers." The world is still dangerous, Dailey said. There is a significant amount of uncertainty that the Army, and Soldiers, must be prepared to face. One way to prevent war -- which is the most desirable course of action, he said -- is to show potential adversaries that the Army is still very capable of combat. "It is a critical time in our Army now. We live in a world of uncertainty. We have to maintain readiness. Our ultimate goal is to not fight," Dailey said. "Our adversaries need to see we are an Army of preparation, and that we are trained and ready to fight in response to our nation's call. That call can happen anywhere, for any type of operation -- whether it's another war, or a contingency operation in one of our partnering nations to help them. This time is just as critical as the last 12 years of war." One aspect of war readiness, Dailey said, is Soldier physical fitness. The Army Physical Fitness Test measures how well Soldiers meet standards. Dailey said the Army is looking at possible new standards for physical fitness. "There is a very extensive, on-going initiative, to take an extremely comprehensive look at Army physical fitness," Dailey said. "TRADOC has been doing a lot of research, really from the last two years, and in connection with the Soldier 2020 effort. I think there will be a change to the Army physical fitness test. But the Army physical fitness test is just an indicator of a level of fitness. I would also encourage Soldiers to do things that make you physically fit. Regardless of what the Army physical fitness test becomes, if you maintain a level of physical fitness, you will do well." Another key component to physical fitness, Dailey said, involves NCOs and commanders leading from the front. "I remind leaders all the time that if you are not going to your place of duty every morning at 6 a.m. for physical training, and saluting the flag with your Soldiers, well then they are probably not doing it either," he said. "And the way you get them to do it is you lead from the front." Today, the Army is in the middle of a drawdown in troops levels. While many Soldiers will leave the Army voluntarily, at some point the Army might be forced to ask some Soldiers to leave. "My advice is to make sure you are doing your best, that you are representing Army values, and that you are truly an Army professional," he said. "Stewardship of the profession is critical. As we draw down, it has been made clear that we will use a standards-based approach to make sure we keep the best Soldiers. We owe that to our Soldiers. We owe that to our leaders. We owe that to the gracious taxpayers of America. "Continue to do your best, work hard, and when you get those opportunities to excel, you need to do that. Study hard when you go to the various levels of NCO education, work hard at physical fitness training. There is plenty of room in the Army, for the future, for those Soldiers who want to stay." For those Soldiers who do leave the Army, Dailey said preparation for civilian life is along the same lines as what Soldiers ought to be doing anyway -- something Dailey said he has been doing now for 10 years. "Take advantage of the education and self-development opportunities that currently exist," he said. "Every Soldier is entitled to tuition assistance, so utilize that. That's a gift from the American taxpayer, to give Soldiers the edge they need when they get out of the service." One unique endeavor the new sergeant major of the Army plans to undertake is to officially engage Soldiers on social media. He said he plans to kick off an advisory group to make that happen. "I'm not the expert on social media," he said. "I come from a generation where I didn't live my entire life with access to computers. That came on very late in life. I do take pride in the fact I am smart enough to consult the individuals that do have the knowledge, skills and attributes associated with the task." Dailey said he will form an SMA, or sergeant major of the Army, advisory group on social media, made up of Soldiers from across the Army, who will advise him on how Soldiers want to be communicated with. "The audience is our Soldiers and the American people," he said. "So who better to ask how they want to be contacted? When Soldiers give you advice, you've got to take it." Dailey joined the Army in 1989, and attended basic training and advanced individual training at Fort Benning, Georgia. He earned the 11B Infantry Military Occupation Specialty, or MOS. Dailey's first assignment was with 3rd Infantry Division at Schweinfurt, Germany. He was promoted to the rank of command sergeant major in 2004. Dailey has served in both Korea and Germany, and has done five combat deployments to Iraq. His first such deployment was as a rifleman and radio telephone operator during Operations Desert Shield and Desert Storm. Dailey's awards include the Legion of Merit, Bronze Star Medal with Valor, three Bronze Star Medals, three Meritorious Service Medals, seven Army Commendation Medals, and 10 Army Achievement Medals. Dailey is also a member of the Distinguished Audie Murphy Club.